Modern teachers increasingly encounter students who enter their classroom with low motivation, learning problems, or disruptive behavior. The mission of this book is to provide teachers and other human service professionals specific tools they can use to teach more effectively without using the punitive methods that are too often part of educational practices. At the same time, the book explains the behavioral science on which behavioral practices are based. 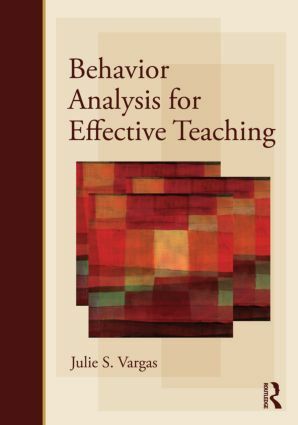 This text is intended for undergraduate and graduate students in teacher education, special education, physical education, and educational psychology as well as for practicing teachers who would like to know what behavior analysis has to offer. The book is also appropriate for students in school psychology, school counseling, school social work and other human service areas. A course using this book as its basic text would qualify as one of the five courses required to sit for the credentialling exams given by the Behavior Analysis Certification Board. Presentation – The author is an exceptionally clear writer who uses a wealth of real (not imaginary) classroom examples. Pedagogy – The pedagogy follows behavior-analytic principles including clear behavioral objectives and coordinated end-of-chapter exercises. The book contains an end-of-book glossary and bibliography. Website – A coordinated website provides additional web-based quizzes, illustrative video clips, and guidelines for research projects that can be done as part of course requirements.